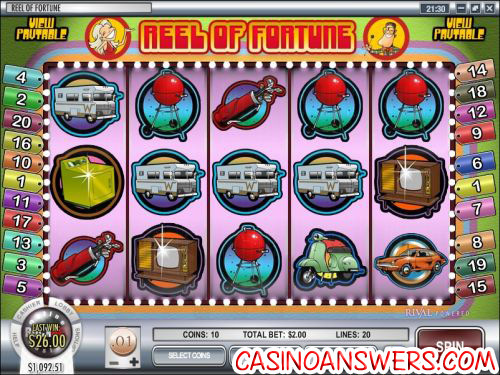 Reel of Fortune Video Slot Guide & Review - Casino Answers! Reel of Fortune is a 5-reel, 20-line video slot developed by Rival, featuring scatter wins and two bonus games. You can play the Reel of Fortune video slot at US-friendly online casinos Rockbet Casino and Mayan Fortune Casino. Before you start playing the Reel of Fortune video slot, you may want to modify the coin size. Your betting options include: $0.01, $0.05, $0.10 and $0.25. Once your coin size is set, you can select how many coins you wish to play (up to 10) and how many paylines (up to 20). The lowest total bet on Reel of Fortune is $0.01 and the highest total bet possible is $50 per spin. There is an autoplay mode available for real money players. To play all 10 coins and 20 paylines, use the “Bet Max” button. Otherwise, play Reel of Fortune using the “Spin” button. To win the 1500 top jackpot on the Reel of Fortune slot game, you must hit 5 RV symbols on an active payline. Other big symbols in the game are the Car and Boat symbols. Reel of Fortune has two scatter symbols – the Curtain and Plunko bonus symbols. Both symbols pay out identically at 1X for 3 symbols, 5X for 4 symbols and 50X for 5 symbols anywhere on the reels. In addition to paying out, they will also trigger two unique bonus games. 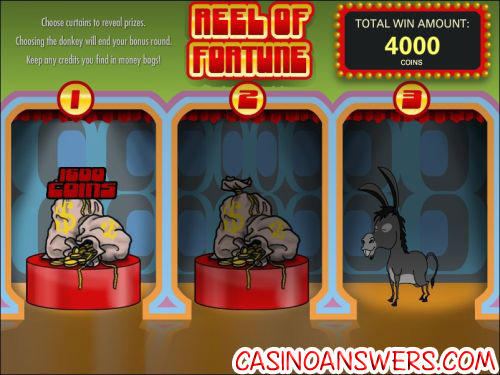 If you hit 3 or more Curtain symbols in Reel of Fortune, you will trigger the Donkey bonus game. The Donkey bonus game is a classic game from game shows where three items are behind three curtains and you must choose the right one. In this case, there will be cash prizes behind two of the curtains and a donkey behind another. You can keep playing until you open the curtain with the donkey behind it. As a hint, for the first round of the bonus game, you will get to see which item is behind which curtain. The Donkey bonus game is easily triggered and gives you the chance to win some good prizes. If you hit 3 Plunko symbols anywhere on the reels in Reel of Fortune, you will activate the Plunko bonus game. If you’ve ever seen The Price is Right, you might be familiar with Plinko. Plunko is virtually the same, except you only get one puck. It is a game of Pachinko where you will choose where to drop the puck. Aim for the 10,000 coin prize and you will risk getting one of the surrounding 3,000 coin prizes instead (the lowest in the bonus game). In the middle of the game board, there is a nudge row where you can direct the puck one last time before it reaches its final destination. The Plunko bonus game is not as frequently hit as the Donkey bonus game, but you are guaranteed a larger prize. All wins in Reel of Fortune are multiplied by the coins staked per line, except for scatters. All wins pay left to right, except for scatters (which pay any). Only the highest win is paid per selected payline. Bonus wins are added to payline wins. The object of the Reel of Fortune video slot is not to win cash playing the regular slot game, but instead to win cash in the bonus games. With that in mind, it is understandable why there is no wild symbol and why top jackpot in the regular slot game is so low. The bonus games are fun to play and that’s what matters here. To play the Reel of Fortune video slot for free, Casino Answers has an exclusive $100 no deposit bonus offer from Rockbet Casino! Are players from the USA able to play Reel of Fortune for real money? Where can I play a Flash game of Reel of Fortune for free? If you are looking to play an Instant Play version of the Reel of Fortune slot for free, you can play it in practice play or for real money at both Rockbet Flash Casino and Mayan Fortune Flash Casino. Are there any other Wheel of Fortune themed slot games? Yes, you can read our 5-Reel Wheel of Chance Video Slot Review for another one, or you can play it now along with the 3-Reel version at the USA-friendly English Harbour Casino. How do I trigger the bonus games on the Reel of Fortune video slot? To trigger either the Donkey or Plunko bonus rounds in Reel of Fortune, all you have to do is hit 3 Curtain or Plunko scatter symbols anywhere on the reels.